Kindly Note that Battery is NOT Included. A superior tool for studio lighting, press interview, micro film, video recording and photography. Made of high-strength engineering plastic outer case, which is perfect combination and durable. Portable for outdoor use with handheld support or tripod. With the design of back bracket, it can use the handheld or scaffolding handles. Small and Slim, Light Size is 144*95*36mm/5.67*3.74*1.42in. High Output Power at 11W, Luminous Flux: 1320LM. Built in with over heat protection and high power fan, suitable for wide range voltage, Average Lifespan ≥50000 hour. Adopts latest strong Anti-Jamming CPU, which makes the circuit more simple, the controlling statistics stable and improves the consistency. Integrated cold shoe with locking ring and 1/4" thread inside, easy to be mounted on tripods or any other devices with 1/4" screws. 2 filters included with Spotlight effect, Diffuse effect, and for reducing the color temperature to 3200K. View More In On-Camera Video Lights. If you have any questions about this product by PERGEAR, contact us by completing and submitting the form below. If you are looking for a specif part number, please include it with your message. 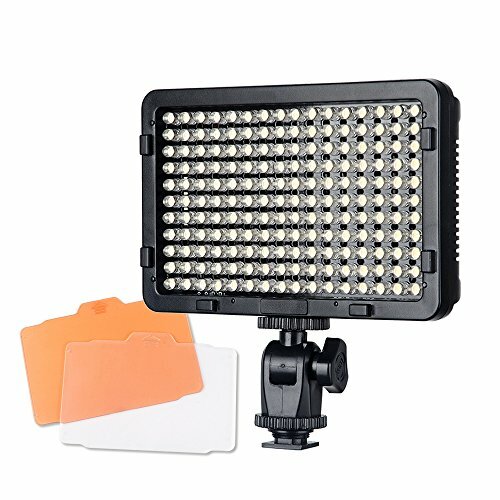 YONGNUO YN1410 YN-1410 LED Studio Video Light Lamp with 5500K Color Temperatur​e and Adjustable Brightness for the SLR Cameras Camcorders, like Canon Nikon Pentax Olympas Samsung Panasonic JVC etc.